David Green is the Vicar of St Mary’s, West Malling and the Rector of St Michael’s, Offham. Before training for ordained ministry, David worked as a New Media Manager within the publishing industry in London. 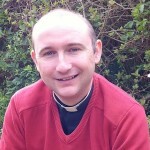 He trained for ordination at Ridley Hall in Cambridge and was ordained in 2008. David holds a BA in Biblical Studies from the University of Sheffield, a Post-graduate Diploma in Ordained Ministry from Canterbury Christ-Church and an MA in Pastoral Theology from his time at Ridley Hall. This is his first parish at Incumbent-level status. Prior to this posting, he was the Curate at St Philip & St James in Walderslade. He began his ministry here in September 2011. Having served for six years as ‘Priest-in-Charge’, David was made Vicar and Rector in February 2018. I am a relatively local boy. I grew up in Paddock Wood and perhaps unusually for some Vicars, I have the great privilege of ministering close to home. In worship, I very much enjoy both new and old… contemporary and traditional forms of church, and I have very much enjoyed our journey so far and I’m excited for all that may lie ahead. When I’m not working for and on behalf of my parishes, I first and foremost like spending time with my wife Kerry and being a dad to my three kids. I’m something of a movie buff and have written and spoken about the use of imagery and films in church. I’m also a bit of an unashamed geek and muck about with computers. Finally, for my sins, I am a Tottenham Hotspur season ticket-holder and that passion does tend to find its way into the odd sermon now and then! You can also follow David on Twitter.